To reach and engage the always-connected consumer, brands need to сonstantly improve their marketing strategies. That is when augmented reality comes in handy. AR apps allow sending the right message in the most prominent way, bringing the benefits of the latest technologies to consumers. Let’s find out how you can use augmented reality to promote your products & services. The VR/AR market will reach 29.5$ billion by 2020, according to Statista survey. Thus, the augmented reality usage is on its rise. Previously we’ve already talked about what makes augmented reality different from virtual reality. Basically, AR means adding digital (virtual) objects to a physical environment with a help of a regular smartphone or a tablet. In such a way, you can engage your target consumers anywhere, on any stage of their buying journey. The in-store marketing, also called the in-store promotion, is a set of marketing techniques, aimed at inviting more visitors to the shop and driving sales. How can you encourage more potential clients to visit your shop? First and foremost, by entertaining them. The augmented reality turns out highly effective in terms of this. 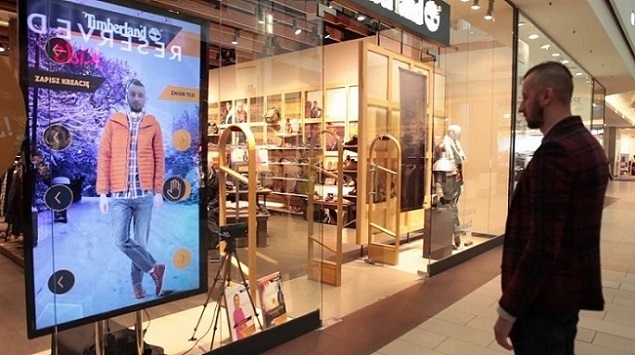 For example, Timberland started by using the augmented reality and Kinect technology in their creative advertising campaign. The main goal was to let customers try on the clothes without actually wearing them. The campaign turned out highly effective, converting a great number of potential visitors into the actual buyers. In 2018, the brand launched a new mass-participation AR game in Madrid, reaching to more potential customers. By installing a giant LED screen in Callao Square, the company invited people passing by to play a keepie-uppie with a Timberland boot instead of a ball. Besides building brand awareness, this campaign helped to bring in more in-store traffic and considerably boost sales. However, not all brands can afford such big-scale campaigns, we get that. That’s why we offer another way to use the power of AR technology – by integrating it into the on-site marketing campaign. For example, invite your customers to use the AR app to scan a specific clothing item in your store, and offer them a discount in return. This way, you can provide value to your clients and make them use your AR app. As simple as that, marketers can boost sales and the in-store traffic. Now brands are actively using the AR-enabled mirrors in on-site marketing. By installing them in intelligent dressing rooms, they offer a convenient & enjoyable shopping process to each visitor. When trying on a specific clothing item, a customer learns some useful information about its style, accessories & other sizes available. Such AR-enhanced mirrors are gaining in popularity pretty quickly according to statistics, especially in retail industry. Integrated into customers lives, the augmented reality can use real-time data about their preferences to offer a more personalized user experience. Here’s how Amazon used the “AR view” feature to personalize their customers’ experience. With the help of Amazon app, users can visualize furniture pieces, kitchen gadgets or anything else in their own homes. Whenever in doubt which sofa would fit best their living room, they can simply check it within minutes. The rendering of the items is realistic enough so you can approach them & view from the different angles. BuildDirect has gone even further, by offering its customers an option to design their own bathrooms. Using the BuildDirect Design Center, now clients can plan the renovations beforehand, adjusting every little detail, materials & fixtures. Think of how you can make your customers’ life easier & shopping experience more convenient. Do your customers feel happy/enthusiastic about shopping? What are their preferences & priorities? Asking the right questions is the first step to effective marketing. Then, figure out how AR technology can help to reach your objectives. Businesses that are still using print advertising should adapt to constantly growing clients demands & ever-changing behavior. Since users now tend to better perceive the information in a digital format, augmented reality can finally bridge that gap between print & digital. More and more magazines, catalogs and other kinds of printed ads are becoming AR-enabled. For example, a famous museum Madame Tussauds created an entertaining AR campaign, by adding some entertaining features to its guidebooks. 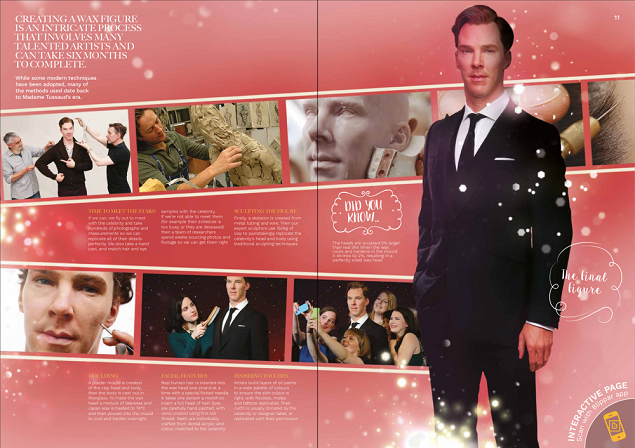 Now, museum visitors can not just read a guidebook – they can explore the whole history around a museum by watching the interviews with Benedict Cumberbatch, discovering how the statues are made & unlocking other types of interactive content. All it takes is to scan the catalog with their phones or gadgets. Lego also modernized its marketing & ads by creating the AR 3D catalog. Now the customers can see what the lego models will look like in a 360° view before actually building them. By making printed ads interactive, you instantly turn your target customers from passive receptors into active users. This, in turn, results in higher engagement & fidelity rates. 71% of users would shop more often if they used AR applications. While shoppers tend to buy more via the retail app, marketers need to offer them a convenient & engaging user experience. Now, users can preview a product without leaving their houses. This “try before you buy” kind of experience is especially important for luxury products. Customers return nearly ⅓ of their online purchases due to a difference between the online image and the item received. All because they can’t see, touch and try on an item before they buy. To prevent this from happening, WatchBox, Rolex and Formex developed the AR platforms. Now users can virtually try on the luxury watches before buying them. The AR apps allow them to see size & shape of the item, examine all little details and make a wiser buying decision. Gamification means applying the elements of game design to the real-life environment. By combining gamification and AR tactics, you can transform the world into a game board for your customers. That’s exactly what Magic Light Pictures together with Nexus Studios did. To promote “the Gruffalo” picture book, the team turned 26 forests into a true playground for British children, bringing the Gruffalo characters to life. What it turned out to be, see by yourself. As you can imagine, the campaign resulted in a positive word-of-mouth, increase in sales & tons of happy children. In total, 13 million app copies were sold worldwide. From 60% to 70% of customers agree on major advantages of using AR in their lives & work. The augmented reality makes brands closer to their customers and has already started to revolutionize the marketing industry. To use the augmented reality technology to its full advantage, make sure to choose among best AR app development companies. And Ukraine has proved to be among top destinations for outsourcing software development services. If in doubt how to use AR technology in your business, study your target audience needs & priorities, and get inspired by the best AR apps.